With the recent capsize and sinking of the mega yacht Yogi in the Aegean Sea off Greece in moderate gale conditions, there has been a lot of chatter about the causes, and several SetSailors have asked us our thoughts. 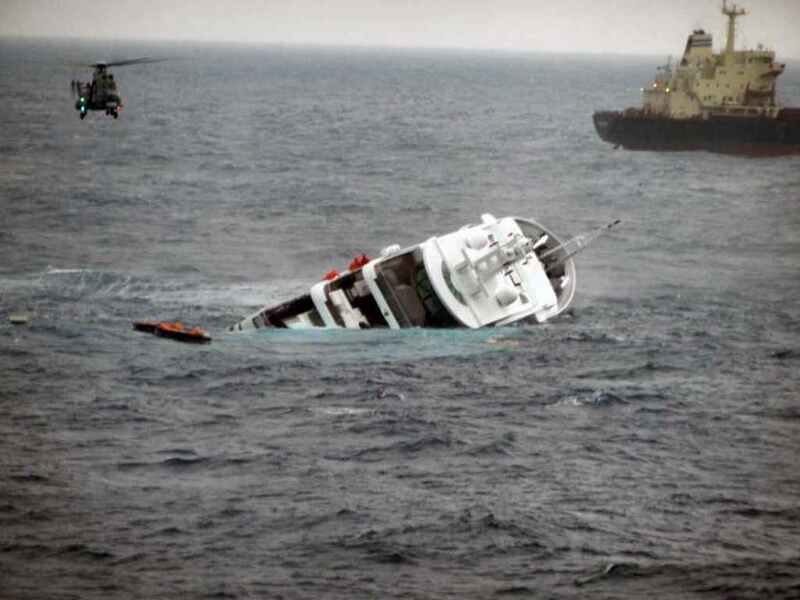 We have not had much time to devote to this incident, but from the photos and scuttlebutt it seems the 60 meter Yogi was disabled, sitting beam to the seas, and became the victim of synchronous rolling which induced the capsize. However, this is idle speculation without more facts. Once we are in possession of something more concrete, we’ll tell you what we think. Following are a few photos of the incident, along with a link to our earlier article about stability and capsize risks for yachts. According to the website Dockwalk.com, the vessel suffered “mechanical difficulties” in “gale force winds”. Another aerial photo of Yogi. From this perspective, you can tell that the seas were probably not running any larger than 10-15 feet/3-5m at their maximum, and most likely less. If you Google yacht Yogi you will find lots of speculation, video, and information on the vessel. Take a look at her waterline length, beam, and draft. She is a high volume configuration in mega-yacht terms, but nothing like the norm for many smaller motor yachts these days. It is precisely this combination of factors which increases capsize risk in vessels that do not have inherent self-righting capability. Click here to read our article on Evaluating Stability and Capsize Risks in Yachts. This entry was posted on Sunday, January 1st, 2012 at 5:49 pm and is filed under Dashew Logs, Design Objectives. Both comments and pings are currently closed. Some recent superyachts of this size have “lifeboat-tenders” stored under the foredeck and lifted out by a hydraulic crane. I don’t think they would have been able to launch such a tender here. Makes me thankful I have a Dashew designed FPB-64!!!!! I will wait to read the BEAmer report on this, but it will need some time to have it. As for the weather conditions, the Coast Guard reports that they were Force 8, a gale with winds between 34 and 40 knots and seas of 18 to 25 feet (5.5 to 7.5 meters)…. 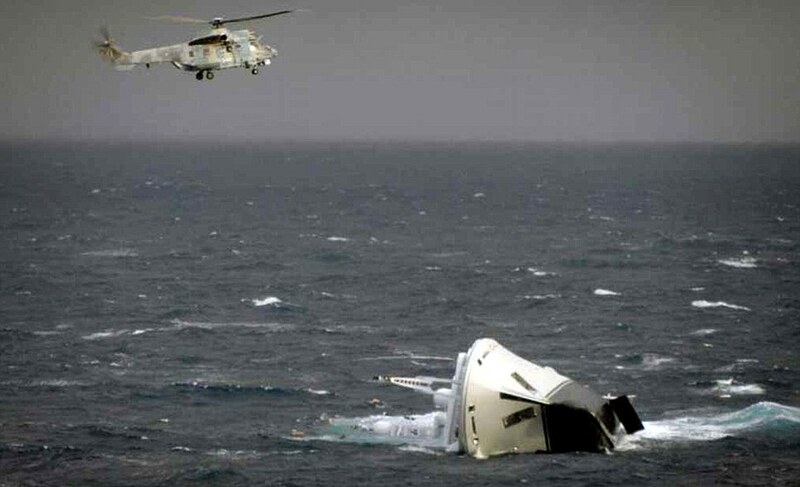 This appears to be a situation where the design of the boat combined with some mechanical failures met a sea condition that it was ill suited to survive. I think we can all agree that a deca-million dollar super yacht should remain a float in gale force winds. On the other hand we have to realize that not every yacht owner wants to move around on a diesel duck either. A couple of years ago a 86′ Azimut motor yacht arrived in our yard for replacement of a blown engine. As we started to investigate other problems with the vessel, we noted that an area of about 1.5 square feet at either exhaust exit was discolored. The water injection mixing canisters to cool the exhaust had been deprived of water by having their intake valves closed by an idiot captain, resulting in all the heat from a pair of CAT V-12’s acting directly upon the fiberglass hull. The resin had been cooked out of the fiberglass to the point where nothing but glass fibers were left. A blow from a 8# sledge hammer was sufficient to hole the vessel which would have sunk down at the stern just like this one did. Interesting that the captain of “Yogi” reports a problem with the engine exhaust as being contributory to the sinking. While at this size it was undoubtedly built from steel or aluminum precluding a similar chain of events to the Azimut, the point is that designers often are more concerned with creating an interior that makes their client salivate rather than asking the what-if questions that make the vessel seaworthy. Speaking of seaworthy, a Nordhaven 76 “long range cruiser” was in our yard for bottom paint at about the same time. When you see one of these out of the water — 2.5 times as tall as it is wide– it makes you wonder how it would survive a moderate gale if the engine or stabilizers were disabled. Just saying—. If nothing else the snap roll on the upper deck when lying abeam would be so severe that being launched into orbit is a real possibility. “Speaking of seaworthy” in comparison to a Nordhavn 76, the opposite in your ratio calculation would be a submarine. Yet they wallow and roll like crazy on the surface and if capsized go straight to the bottom. Without engine(s) the Nordhavn would simply keep it’s bow pointed into the prevailing seas using standard time tested methods. Stability and safety have much more to do with design and procedure than appearance. We’d be interested in knowing the time tested methods that would keep any motor vessel head to wind if disabled in a gale, and in particular designs with large amounts of windage forward. We assume this is something other than a para anchor since hanging onto one of these in a blow typically results in substantial shearing. If any SetSailors have experiences with disabled vessels and their angle to wind and sea we’d love to hear about them. What sort of naval architect would design a boat like this.?. Reminds me of Joseph Banks and James Cook…Banks wanted to build a tall multi story cabin block on the Endeavour and Cook canned it for the very reason that it was too high and would make the ship unseaworthy !….seems some people never learn !